Do you know that 85% of the organizations across the globe are already using a multi-cloud strategy to increase their business productivity? In the past few years, we have seen a dramatic increase in the number of companies adopting cloud computing strategies. From using applications on local machines to now hosting it on a remote cloud location, companies have started seeing various benefits of using the same application over the internet. Cloud computing in business is becoming the new normal, and it is estimated that most of the companies will be using at least one cloud service by the end of 2018. Today, cloud computing serves as an opportunity for small businesses to get access to high-end technologies, which was earlier restricted only to large IT companies. Cloud computing enhances business productivity, process efficiency, cash flow, and also offers a series of other benefits. This article lists top benefits of cloud computing for businesses and impact of cloud computing on SMBs. 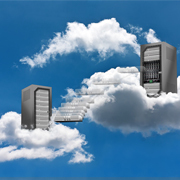 Cloud computing can help companies to reduce the costs required to purchase expensive hardware. Companies can use a pay-as-you-go or a subscription model which can help in reducing operational and infrastructural costs. The ease to setup and manage a cloud infrastructure makes it even more business friendly. Cloud computing in business can help employees of the organization access the required data and work from any part of the world with an internet connection. Most of the cloud services today also provide mobile apps which can be used to access the data from the phone, without being dependent on a single device. Cloud computing allows smaller companies to get access to some of the state-of-the-art tools and technologies, which were initially restricted to only large companies. Now, even the smaller businesses can act faster and give a tough competition to the bigger organizations and successfully disrupt the market. With cloud computing in business, companies do not have to worry about the software and firmware updates. The servers are off-premise and the service providers take care of all the latest software updates which need to be done. The time and investments required to maintain the servers and software are saved. As the cloud service providers store all the data in the cloud, there is no threat of data loss in case of emergencies. Small businesses can't usually afford expensive disaster recovery systems. Cloud computing has helped such businesses to safeguard their data by providing cloud-based storage solutions. This is one of the key advantages of cloud computing. When a company is growing at a massive rate, it becomes easy for them to quickly scale-up their services using the cloud platform. Similarly, if anyone wishes to scale-down the requirements, it can also be easily done. Operational agility is one of the major business benefits of cloud computing which is welcomed by top tech giants of the world. Before cloud computing was adopted, employees would have to send the files back and forth several times before the final document was created. This process would lead to several errors and reduce the accuracy of the document considerably. With cloud computing in small businesses, multiple users can access the same document from different places and this reduces the error rate considerably. When a company uses the cloud computing platform to scale-up or scale-down the capacity, only the server capacity is changed, using certain amount of energy for the process. This reduces the chances of leaving large carbon footprints which would have occurred before the cloud platform was adopted. Not Moved to Cloud Yet? Outsource2india Can Help You! Outsourcein2india is an outsourcing company, offering a variety of cloud computing as well as software development services to global clients for over 20 years. Our vast experience of having worked with clients from different industry sectors has helped us gain expertise in the latest technologies such as cloud computing, artificial intelligence, machine learning, etc. Our team of software developers and testers help us to deliver top quality services to our clients within a quick turnaround time at highly affordable rates. If you are looking for a reliable, efficient, and affordable software development service provider, then you have come to the right place. Get in touch with us today.